One of the areas where improved interoperability is needed is in the rotary wing community. It has been documented that standardization of rotary wing qualifi­cations across the Alliance has been an ongoing issue. A potential solution for this standardization issue would be to establish a training facility where NATO rotary and fixed wing aircrew and maintainers can receive education and training that addresses this issue. Fortunately, such a solution is evolving with the foundation of the Multinational Aviation Training Centre (MATC). The roots of the MATC can be traced to the Multinational Helicopter Initiative (MHI) and the subsequent Air Advisor Team Pre-Deployment Training (AAT-PDT) course programme. The MHI was established in 2008 on the basis of a ­bilateral summit between France and the UK and is designed to support the development of a number of multinational transport helicopter projects. Initially focused on raising the number of mission capable helicopters for ISAF, it seeks to help those countries that do not have the resources to deploy and run a transport helicopter operation on their own. In addition, the MHI supported the European Defence Agency (EDA) led Helicopter Exercise Programme (HEP) – including HOT BLADE exercises – and training packages under the common title of Helicopter Training Programme that include several courses such as the Helicopter Tactics Course, Helicopter Tactics Instructor Course and Operational English Language Course. The MHI also supported the HIP Helicopter Task Force (HTF) initiative which facilitated deployment of Czech helicopters to ISAF in 2010 -2011. The HIP HTF ini­tiative includes 10 nations (Albania, Czech Republic, Hungary, Italy, Norway, Poland, Slovakia, Spain, UK and USA). Being created in February 2009, it is currently moving towards termination as most of its objectives were taken over by MATC. The first AAT-PDT course started in 2012 as an effort to streamline the preparation and training system for aviation personnel (helicopter aircrew and main­tenance specialists) for the nations supporting the Aviation Security Force Assistance (AvSFA) advisory teams across Afghanistan. The main objectives of this course were to standardize aircrew procedures, consolidate the conduct of mentor training, and improve the overall level of flight safety for the participating nations. The AAT-PDT consists of two parts – simulator training at the Helicopter Training Point (HTP) Ostrava, Czech Republic and flight training at Zadar Air Base, Croatia. Each course is supervised by experienced contracted helicopter instructors and typically supports approximately forty personnel from Czech Republic, Croatia and Hungery. For each course, 20 aircrew members attend the Simulator Phase and twenty maintenance personnel join them for the flying training in Zadar. Provide conditions to deploy helicopter capabilities and trainers to theatres of operation via a comprehensive and standardized training scheme. A Letter of Intent (LOI) to work together towards establishing the MATC was signed by Croatia, Czech Republic, Slovakia and USA on 21 February 2013. Hungary also formally joined this initiative on 20 Sep­tember 2013. The Initial Operational Capability (IOC) of the MATC is planned for 2015 and Full Operational Capability (FOC) should be achieved about two years later. Through improving overall NATO AvSFA capabilities, the MATC can significantly contribute to ‘military ­assistance’, one of the three core tasks of NATO SOF (besides strategic reconnaissance and direct action), and thereby help to ease the identified SOF capability shortfall. The MATC could be one of the SOF training centres mentioned in the SOF initiative and could eventually support other types of helicopters or fixed wing aircraft with an adequate level of NATO support. It is currently considering the possibility of supporting other helicopters or fixed wing aircraft in the future if it is determined the requirement exists. Despite the sweeping changes that are going on in Afghanistan with respect to NATO’s future involvement, a statement in the NATO Chicago Summit declaration from 2012 indicated that a post-2014 mission of a different nature, to train, advise and assist the ANSF, including the Afghan Special Operations Forces, will continue in Afghanistan.8 This SFA competency to train, advise and assist partner nations will improve NATO’s ability to advance NATO interests and security. A robust SFA capability permits NATO to ‘engage actively to enhance international security, through partnership with relevant countries and other international organizations,’ ‘employ an appropriate mix of […] political and military tools to help manage developing crises that have the potential to affect Alliance security, before they escalate into conflicts’ and ‘help consolidate stability in post-conflict situations where that contributes to Euro-Atlantic security.’9 The ability to provide air-centric training, advice and assistance to a partner nation’s aviation organization(s) has been recognized as an important tool in the mentoring and development of relations with non-NATO partner nations where common interests are shared with NATO, especially as NATO’s role in the world evolves post-Afghanistan. AvSFA can improve internal and regional security and stability as well as create an environment for improved economic development. The MATC can be an important tool in helping to improve NATO’s SFA and AvSFA capability as one of the SOF Training Centres. As another option, it could also serve as the foundation for a NATO SFA Centre of Excellence. In ­either one of these forms, MATC could address many long standing NATO shortfalls. From standardization issues to SOF capacity gaps to aircrew qualification matters, the MATC could form the bedrock for addressing NATO SOF concerns that could help evolve the Alliance so it is better suited for the defence challenges of the future. 1. JAPCC studies like ‘Improving NATO Support to Future Air Advisor Operations’ and ‘Enhancing NATO’s Oper­ational Helicopter Capabilities – The Need for International Standardisation’ highlight interoperability issues and the air operations community. 3. Media backgrounder; Jun. 2014, http://www.nato.int/nato_static/assets/pdf/pdf_2014_06/20140602_140602-Media-Backgrounder_Multinational-Projects_en.pdf. 4. MATC Multinational Project Team, MATC Concept, (28 Feb. 2013). 8. Chicago Summit Declaration; Issued by the Heads of State and Government participating in the meeting of the North Atlantic Council in Chicago on 20 May 2012. 9. 2010 NATO Strategic Concept, Para 4.
was a distinguished graduate of the USAF Academy in 1990 and an honor graduate of US Army Flight Training at Ft Rucker, AL in 1991. 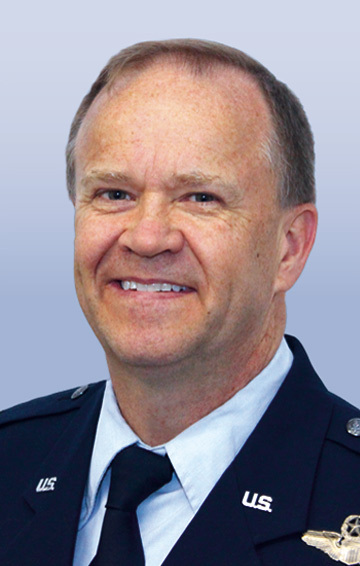 Colonel Willi holds a Master’s Degree from Embry-Riddle Aeronautical University and is a graduate of the USAF Squadron Officer School, US Naval Weapons School, USAF Air Command and Staff College, and the USAF Air War College. He was the Personnel Recovery Core Function Team Chief at HQ Air Combat Command, Langley AFB, VA, served as the Commander of the HH-60 Combined Test Force, Nellis AFB, NV and was the Deputy Group Commander of the 438 Air Expeditionary Advisory Group. Colonel Willi was an HH-60G/H, SH-60F and Mi-17 evaluator pilot and has flown combat missions in Operation Southern Watch and Operation Enduring Freedom. Colonel Willi is currently the Combat Air Branch Head at the Joint Air Power Competence Centre in Kalkar, Germany.